3) Paste PGN into box and select what color you were. 5) Copy the code from...."If you want to insert this replay into your webpage or blog, use this code:"
6) Paste it in the blog! It will look like mumbo jumbo when you look at the pasted code, but once it gets published, it will look something like this. This is one of my French games from ICC. It was blitz, so forgive the errors. Later in the week, Christiansen - Nakamura played the same opening by transposition at the US Championships. There game can be found buried somewhere here. Yahoo Military Chess Group just posted the United States Armed Forces Open information for 2010. This is a FREE USCF-rated tournament open to all active duty, reservists, military retirees, cadets, midshipmen, ROTC (with DOD ID), and the Coast Guard. It will take place at Joint Base Andrews, Maryland this October 9th-11th. Already, two players joined advanced entry including author of "Improve Your Chess at Any Age" Andres Hortillosa. Last year it was held in Gettysburg, PA where Technical Sergeant Robert Keough took clear first. One of his wins came from me in the fourth round! Here is an article written about our game and the event. Another opportunity for military chess players....the Inter Service Chess Championship. I just turned in my application for this year's tournament. I had the privilege of playing in this tournament back in 2008 and 2009. Kenilworth members Arthur Macaspac and myself both competed in it back in 2008, but did not play against each other. We saved that for the 2010 KCC Championship! If you are in the Marines (active duty or reserves), you are eligible to play in this year's Inter Service Chess Championship. I look forward to having the Marines field a full team this year! Here is the MARADMIN that came out. Applications are due May 31st. This is a great opportunity for chess playing leathernecks, so make sure you take advantage of it! Top Marine goes to Denmark to compete in the 21st NATO Championship. If you have any questions, please let me know. 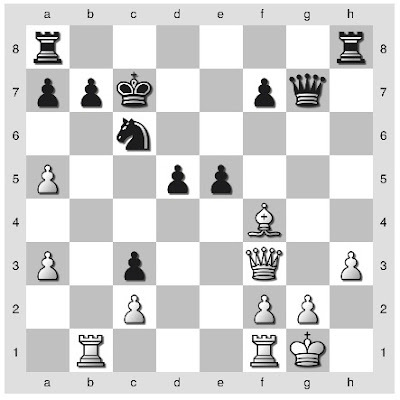 Make sure to check out Yahoo Military Chess Group because it has a wealth of information. This tournament is in memory of former Kenilworth Chess Club President (1975-1985) Irving Ellner (1918-2008). The Kenilworthian has annotated a couple of Irving's games. You can read more about his role in the club on Mike W's History of the Kenilworth Chess Club. White to play, what's the best move?